Fisker Automotive, the VC-funded firm building the beautiful and expensive Karma plug-in luxury hybrid, just closed on the first $58 million of a $150 million round according to this Form D filing spotted by Business Green. Fisker has raised more than $700 million in private equity from Advanced Equities, KPCB, et al., along with a substantial amount of loans and grants. The Fisker Karma is an extended-range luxury electric vehicle that seats four. The car is powered by twin 201-horsepower electric motors and can provide a range of 300 miles and a top speed of 125 miles per hour -- although you might not get both of those things at the same time. The car is a series hybrid, and in that sense is similar to the Chevy Volt made by GM (NYSE:GM). It has a lithium-ion battery pack (with battery cells from A123 Systems) that powers the car. The Karma also comes with a gas generator to recharge the batteries when they get down to a 20 percent state of charge. The vehicle is designed by Henrik Fisker, the hand behind the sleek Aston Martin DB9 and BMW Z8. Better Place just scored $200 million from their investors in a Round C, bringing total VC funding to date to $750 million to launch its grand vision of car transportation-as-a-service along with battery swapping. The company states that the company’s valuation is "$2.25 billion (post money valuation on a fully diluted basis)." The company claims that "the launch of the first nationwide electric car networks in Israel and Denmark" is just months away. New investors in the Series C round include GE and UBS AG, among others. Existing shareholders, including Israel Corp., HSBC Group, Morgan Stanley Investment Management, VantagePoint Capital Partners, Ofer Group and Maniv Energy Capital, also joined the round. According to the firm, Better Place owns and operates a network of battery switch stations and public/personal charge spots, along with the supply of batteries that power the cars, to provide drivers with instant range extension and the convenience to drive, switch and go across an entire region. Greentech Media was invited by Tesla Motors for a test drive in the new Model S beta last week at the firm's Palo Alto, California facility. The beta is the phase of vehicle development before it reaches full production. Despite my pleading, the firm did not allow to me to drive; I had to settle for being driven around the suburban neighborhood surrounding Tesla's headquarters. The car is plush and elegant, and starts at the touch of a push-button control. The seats are made of vegetable-tanned leather. There are wood accents on the dash and an expansive panoramic moonroof. The car was amazingly quiet: Tesla has worked hard to minimize NVH (that's noise, vibration and harshness). The console is dominated by a 17-inch touch screen which controls all car functions from climate to music to navigation to communication. The screen does seem like it could be a distraction. The charge plug is smartly hidden behind one of the taillight lenses; it responds to driver and plug proximity. Tesla has received more than 6,000 reservations for the Model S, a four-door, sportback sedan with room for five adults. The car does 0 to 60 mph in less than 6 seconds and can charge on any conventional 120-volt or 240-volt outlet. The vehicle comes with three range options: 160 miles, 230 miles and 300 miles. 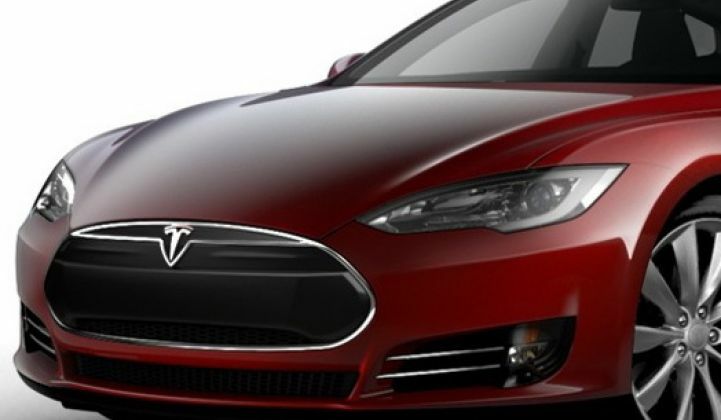 According to the firm, in the U.S., the Model S starts at $57,400 or $49,900 after the U.S. federal tax credit. The 230-mile Model S starts at about $10,000 more and the 300-mile Model S starts at about $20,000 more than the base price. Model S sedans will start being delivered to customers in mid-2012 with a target production of 5,000 units in 2012 and 20,000 vehicles per year after that. Tesla was the first American car maker to go public since Ford in 1956. It currently has a market cap of $3 billion. 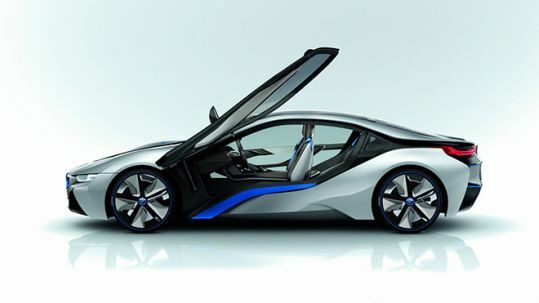 BMW's i8 electric vehicle, shown above and featured in Wired, is admittedly a concept car at this stage, but BMW claims that the plug-in hybrid sports car it is only a few years from production.